I've always been the type of person to try and find the more natural remedies for our daily activities such as bathing, whether it was making my own soaps or finding companies that believed in organic and harmful chemical free products. 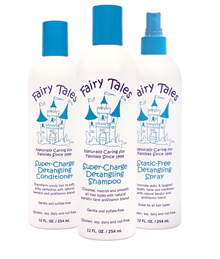 I was recently asked to review more of the products over at Fairy Tale Hair Care. Fairy Tale Hair Care sent me over their newest products - Tangle Tamers for Children Infused with Natural Keratin Protein. While I'm not sure what I can say about a child's shampoo, I can tell you right away this smelled amazing. It had a fruity, pineapple scent, which the boys liked a lot. It made me think of being on the beach when washing their hair. Fairy Tale Hair Care products are all natural, free of parabens, pesticides, and toxins, as well as gluten, nut-free and dairy. In addition, these products are sulfate free which helps from stripping hair of the natural oils. The shampoo left Danes (long) curly locks soft and silky. His hair did not tangle as it usually does when wet nor was it oily or have any residue left after. Usually his hair looks all frizzy once dry (especially once he starts playing) and it instead stayed shiny all the next day since we take bathes at night. This was so effective (and still smelled amazing the next day), I told my 16 year old daughter she needed to try it since she has a full head of thick curly hair. To be honest with you I don't know what else to say other than I LOVE these products and would recommend it to anyone with children, especially any that have thick/curly/frizzy/excessive amounts of hair. The best part is this is a natural product, so you know you are using only the safest on your family! Recommendation: To be honest with you I don't know what else to say other than I LOVE these products and would recommend it to anyone with children. Their prices are even reasonable for such a natural product although, I would love to see some coupons or special deals!